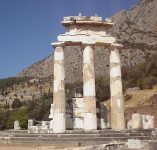 On Sunday, 3 September, we left our hotel at 9 a.m. and rode about 1 mile to the archeological site of Delphi, one of the major centers of idolatrous worship in ancient Greece. According to legend, there was a sacred stone here which marked the exact center of the earth. There were many limestone and marble buildings here. We cannot imagine how the stones were brought up this mountain, especially when some came from as far away as Athens. At the temple of Apollo, "prophecies" were given to all who sought the advice of the "Oracle of Delphi." Apparently, the woman who could predict the future would be worked into a frenzy till she was gibbering incomprehensibly (probably just like what some religions today call "speaking in tongues"). The priests, who knew in advance what question would be asked, would provide the inquirer with a carefully worded interpretation of this gibberish. The advice given by the oracle was always ambiguous, having more than one meaning, so that the activities at Delphi would not be discredited. 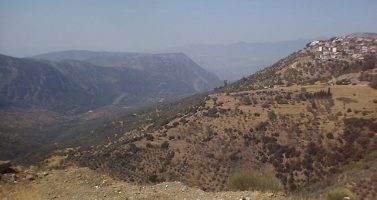 The archeological site reveals several levels on the side of a steep mountain. 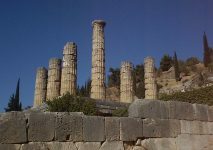 The lowest level we saw had a round temple, called a tholos, dedicated to Athena. This was the first of only four round temples ever built in Greece. It is believed that the mountains encircling Delphi were the inspiration for the creation of the tholos. From a distance we could see the remains of the gymnasium, not presently open to the public. Then further up the mountain slope runs the modern highway to Athens. Beside this road is the Kastalian Spring, which in ancient times was used for purifying the worshiper before approaching the Oracle at the temple of Apollo. Most in our group tasted the water from the spring. Actually, the area we entered first was above the highway, shortly after 9 o'clock. Here we saw the conical stone called the "navel" of the earth, the Rock of the Sibyl, and the remains of the temple of Apollo. Also here is the old wall with thousands of inscriptions carved in the stone. Higher up the slope is a theater and high above that is a stadium. Jeannie chose not to climb to the stadium, but viewed Michael's digital photos as soon as he descended. Because of the incredibly beautiful surroundings, we took lots of pictures here. In spite of sitting in the front seat of the bus, Jeannie had not been feeling well until today. Now another person in the group was sick. Since we've been traveling and eating together for a few days, our group was very accommodating toward the one who was sick. Our bus driver was one of the best we've seen. He did a super job controlling a steady speed, making turns and stops very smoothly. His skill really lessened Jeannie's tendency to suffer motion sickness. About noon we left the archeological ruins of Delphi and traveled to the village of Arahova, which appears to cling to the side of a mountain (like Positano on the Amalfi Coast in Italy). This place is known for its locally-made rugs and embroidered linens. Across the street from a monument honoring the village native Dr. George Papanicoloaou, after whom the PAP smear was named, we bought an oriental rug in the first shop we visited. Though we wondered how we would get it back to the States, the price was too good to pass up. We thought this royal blue and gold rug would look great in our entry hall. After just a half-hour stop in Arahova, we were on the road again, before we spent all our money. We soon stopped for lunch at a taverna where we were served some typical Greek dishes. Soon we were out of the mountains and crossing the plain of Panope to Athens. Much cotton is grown in this area. As we passed through the small town of Thiva, our tour guide told us that this was once the prominent Greek city-state of Thebes. According to legend, it was here that Oedipus, unaware of his parentage, killed his father, solved the riddle of the Sphinx, then married his mother. We were returned to our hotel in Athens about 4:30. We were pleased that we again had a balcony with a view of the Acropolis. After a visit to the ancient artifacts displayed in the nearby subway station at Syntagma Square, Michael checked e-mail at a local Internet cafe while Jeannie returned to our room. At 5:40 p.m. we took a taxi to the international service of the Omonia church of Christ. There we met with Christians from Albania, America, Bulgaria, Greece, Nigeria, Philippines, Romania, and Sudan. Michael declined an invitation to preach, but agreed to say the opening prayer. We were pleased that most of the service was in English. Dino Roussos, whom we first met in 1984, preaches for this congregation. His wife and son were on holiday on Santorini, one of the popular Greek islands. His daughter, a junior at Harding, was a student at Florence last summer with Greg and Angelique. We think we spoke to everyone after the service, which lasted about 1 1/2 hours. When we started to leave, Dino offered to take us with him to eat supper. He also took in his van the principle teacher of the preacher training school, Jim Stamatis, and his wife, Nell. After supper we walked to our hotel, only about a block from the restaurant.